In my review of last week’s The Walking Dead, I talked about how Carol (Melissa McBride) has found her confidence in this post-apocalyptic scenario and has become a survivor. I also said I didn’t think she was the one sabotaging Rick’s attempts at creating a civilized society of some sort. I was dead wrong about that! I don’t know what to think about her revelation that she killed two people in cold blood and then unceremoniously (not that ceremony seems to matter anymore in this world) burned their bodies. While I understand her reasons, I ultimately don’t think it was a good thing. For someone to make that decision on their own is a loss of everything they have been working for. Things are coming apart at the seams and only look to get worse. 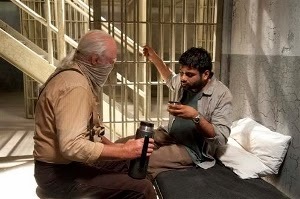 The prison is no safe haven and it looks like they might not even be there for long (which would be great; is any viewer not tired of the prison location yet?). 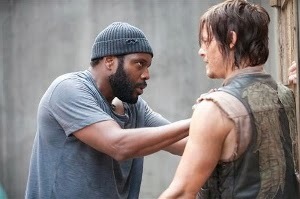 Already Daryl (Norman Reedus), Michonne (Danai Gurira), Tyreese (Chad L. Coleman), and a new character Bob (Lawrence Gilliard Jr.) are lost in the woods, following one of the most harrowing walker attacks in a while – and that’s considering the attack at the Big Spot was pretty intense. Desperate for medication, that group headed off to a medical facility at the suggestion of Hershel (Scott Wilson) only to find the road leading to it completely overrun with the undead. So no medicine for the sick back at the prison and their toughest fighters are on foot in the woods. Back at the prison things are even direr with a deadly “flu” going around. I’m not sure it’s really the flu considering people are coughing up blood. Whatever it is, it’s highly contagious and has infected nearly everyone. Glenn (Steven Yeun) has it, but I’m doubting he will die from that. One thing about this show is that, for better or worse, it starts to become a guessing game about which of the main characters they will kill off and when. I’m sure there are some surprises in store, but I feel like Glenn succumbing to this illness might be a little too easy. We will see. Again, this season is off to a good start and I hope it continues. With everything happening I haven’t been missing the Governor (David Morrissey) at all. Right now I don’t see how he would integrate back in, though I suppose it will happen at some point. It’s just that the real drama is more interesting than some kind of personal vendetta. I only hope that when he does reappear, it makes sense and is relevant to the rest of the story.